On Saturday I took Callie out for our normal morning walk. The morning was clear and the sun was just coming up. I like this time of year. Late summer, moving into fall. The grapes are looking pretty ripe now. Ken just found out from the grower (he bought some wine from them on Saturday) that the harvest is scheduled for the end of September, about three weeks from now. It all depends on the weather, I'm sure. The dew point is high; everything is wet in the morning. The season change is imminent. We can feel it in the air and see it in the plants around us. Fall is my favorite season and we're both looking forward to it. I've actually found myself hoping for snow this winter. Wow. Vines in the morning light. We're getting We got our wood this weekend, en principe. That means that I've got the big job of cutting it into burnable size before the heating season begins. I've already got the chainsaw blades sharpened, so I'm ready. 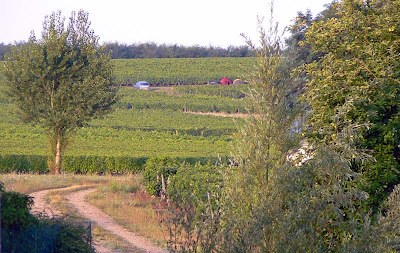 The dirt road through the vineyard. 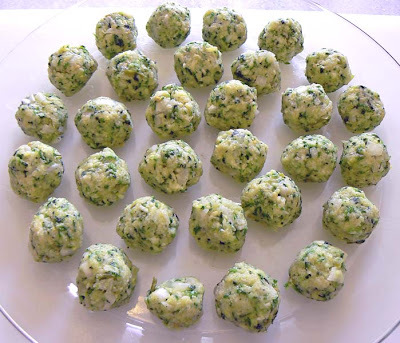 Zucchini balls. I'll resist the urge to go for the cheap joke. Thirty boulettes ready for the fryer. 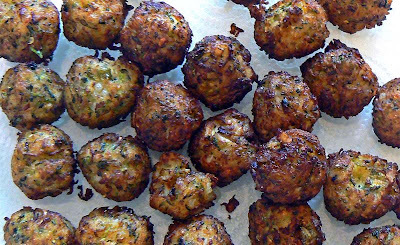 I made these great little vegetarian morsels once before. We liked them a lot and decided to do them again. The zucchini plants are producing like gangbusters and I'm trying to pick the squash before it gets too big. This recipe is pretty easy. You have to grate the zukes (I use the food processor) and squeeze the juice out of them. The juice gets saved to go into the sauce, which is a spicy curry-like dip. But I think you could use any sauce, from ketchup to whatever you like. And here they are cooked! The balls are made with the grated squash, grated onion, minced ginger, minced chili pepper, and some corn meal to bind it all together. I added some cayenne and some smoked paprika. Then they get fried; we use our deep fryer, but I'd bet that doing them in a frying pan with about a half inch of oil (turning frequently) would work just fine. A close-up of the cooked boulettes. They're so good that I'm freezing bags of grated zucchini so I can make them again a few times over the winter. 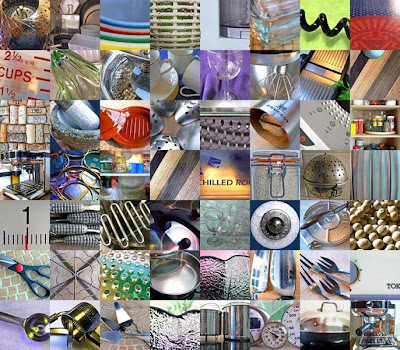 Some of the pictures end up a bit cropped since the program makes them all the same size, but the essence is there. I'm thinking of doing something similar with the Eiffel Tower series. What do you think? ps - If you're a glutton, you can click on the "kitchen collection" category in the sidebar and look at the original entries. I took whatever came up first. I cropped the photo so it would fit into the square album format, but otherwise it's untouched. This is probably the first and last album that will ever be made by this fictional group. I mean, who would buy music from a band with that name? 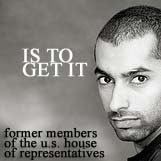 A strange coincidence, though: I actually used to work in the U.S. House of Representatives back when I lived in Washington, DC, many moons ago. 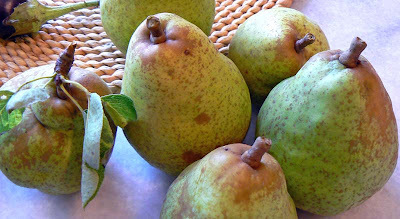 These are the second batch of poires (pears) from our tree this year. It's a small poirier (pear tree), and it's quite old according to the woman from whom we bought the house. A few pears from the tree. The pears are hard as rocks, so we put them in paper bags to ripen them. The first batch ended up in a cake. These, if I'm lucky, will go into a tarte. And even though we've seen them in the vineyard, I've yet to see une perdrix dans le poirier (a partridge in our pear tree). We'll be spending Sunday recovering from our neighbors' twelve hour party. Way too much food. After what obviously were appetizers with bubbly wine, a big buffet was set out and bottles of red and white were put out on the tables. I had some of everything, wanting to taste it all and to be polite. Another harvest of beans from the garden. Well, it turned out that that was only the first course, and there were many more to come, not to mention a full dinner later in the evening. I should have known. I am still full. 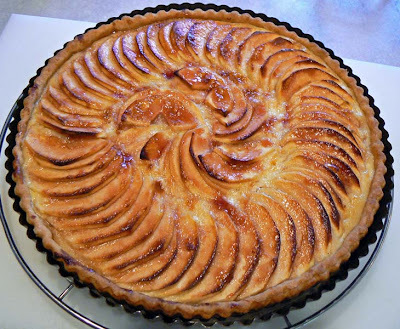 An apple tart with fruit from our trees. In between Ken and I were dashing home to check on the dog and to use our bathroom. At around six p.m. I took Callie out for her walk. 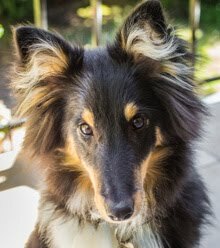 When I told our host I was going to walk the dog and thanked him for his hospitality, he said, "You're coming back after, right? It's a complete day, you know!" So after the walk it was back to the party for an evening bbq and dinner under the stars. Ouf! When the weather is nice, i.e. over 20ºC and no rain, we can leave the doors to the deck open. Callie loves to go out onto the terrace to hang out. She'll sit out there alone as long as the door is open and she can hear all that goes on indoors. Callie and her sock on the deck. If we let her out there and close the door, she'll be nose-to-the-glass after about a minute begging to come back in. She wants to be outside, but she doesn't want to be separated from her pack. 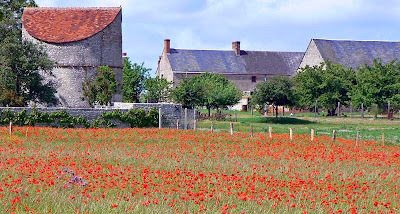 A typical spring scene in Touraine/Sologne. ... and the promise of summer yet to come. Oh well. Fall is just around the corner, and as you've been reading, we're gearing up for fall chores, getting the house and yard ready for winter. In addition to wood-cutting and hedge-trimming, I've got another project: I want to take down a dead and dying apple tree in the yard. It's not all that big, so I think I can do it. And the kindling and fire wood it'll make will be great. Before I tackle that, I have to go to the hardware store and get my chainsaw chains sharpened. They're so dull from last fall's wood cut that they probably wouldn't slice butter. Sunday was bagel day. I've been wanting some bagels for a few weeks now, and when a fellow blogger mentioned he was eating them in Paris, I figured that I just needed to make a batch. 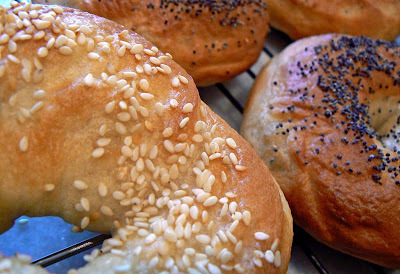 Oven fresh bagels - sesame and poppy! 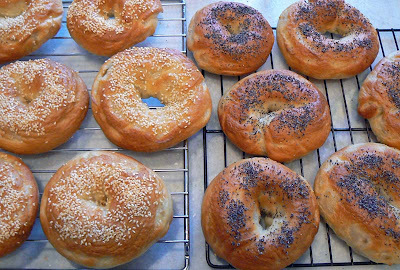 I've made bagels before, and you can look at the pictures that Ken took here. The first step is to make the dough, of course, which is nothing but flour, yeast, and water (with a little sugar and salt). 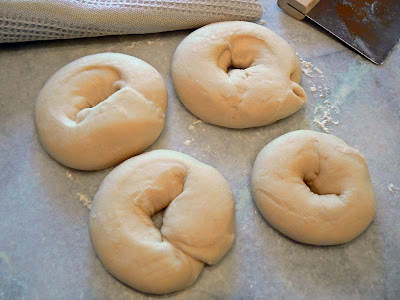 After a rise, the bagels get shaped and are left to rise again. The next step is to simmer them in water. 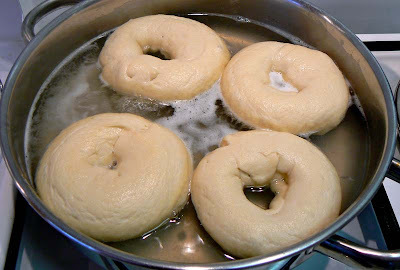 I add a tablespoon of honey to the water to give the bagels a nice glaze when they're baked. After the simmer, they get drained, then sprinkled with whatever topping you like. I used sesame and poppy seeds. This is why they're called water bagels. Then, into the oven they go! The whole process, from start to finish, took just over two hours. That's for a batch of one dozen bagels. Waiting to go into the oven. We ate a few of them for lunch this week with cream cheese and smoked salmon, and cream cheese and ham. The rest are in the freezer. 16 people have used a bidet as intended. 25 people have used a bidet for other things. 3 people have a bidet at home. 9 people want a bidet at home. 12 people have never used a bidet. 2 people have never seen a bidet. And absolutely none of you said, "yuck, ick, gross!" This goes to show that wcs : Another American in France readers are well traveled (at least in France) and quite savvy. I would add tasteful, too, but that's just my bias. That would be me. Or what I'm turning into. I don't like being waken in the night. Two times this week. And there's not much I can do about it. But I can blog. Rogue campers seen from my window. Over the past five years there have been a few instances of somebody spending the night out in the vineyards behind our house. I've seen the occasional RV out there early in the morning, or a discreetly pitched tent. Usually the rogue campers come in late, spend the night quietly, and move on in the morning, trying to be very inconspicuous, obviously on their way to someplace else. But this time it's different. These people keep coming back. I think they're pretty young, and they're loud, and they're making a camp fire and leaving empty bottles on the ground. They've been out back at least two nights this week, and I'm pretty sure there was a third. They pack up around ten or so in the morning and leave, then come back after dark (and after midnight) and set up again laughing, partying, and making fire. 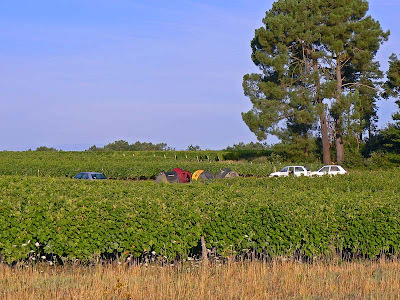 Camping among the vines. Arrrrgh! Their noise woke me up at 2 a.m. on Thursday morning and again on Saturday morning. I took my camera out Saturday morning but I couldn't get close enough to photograph their license plates because one of the campers was actually up at 8 a.m. milling about. But I did notice on Thursday that they were local - the license plates are from our department. They might even be the kids (and their friends) of the people that own the vines. I can't believe that I'm reduced to wanting to photograph their license plates. What the heck would I do, take the pictures to town hall and complain like a lunatic, grumpy old foreigner? No. But now that I've blogged about it I feel much better. 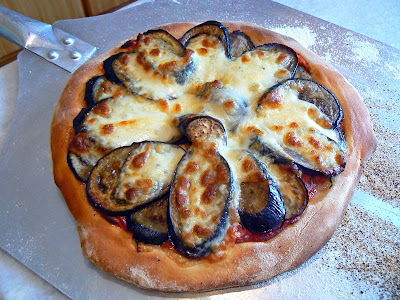 On Friday I made eggplant pizza with aubgergines (eggplant) from our garden. We've harvested at least six eggplants so far, and there are many more coming along. If you've been reading this blog for a while, you know that I love pizza and that I love to make my own pizza. Four eggplants from the garden. Of course, the first step is to make the pizza dough. I do that with flour, yeast, honey, salt, and olive oil. The dough gets mixed, then kneaded, then it rises. After the first rise, I punch it down and let it rise for a little while in the fridge, just to slow it down a bit. 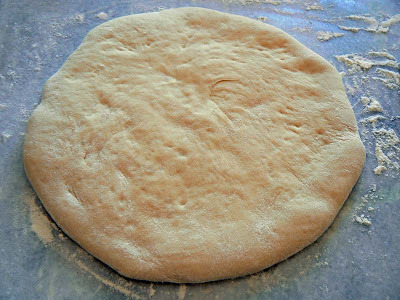 The dough is formed and rises a third time. After that, I form the dough into rounds and let it rise again while the oven heats up. I had already sliced and roasted the eggplant at that point. I thawed out some roasted red pepper purée that we had in the freezer to serve as the sauce. The first assembled pizza ready for the oven. Then it's on to the assembly. 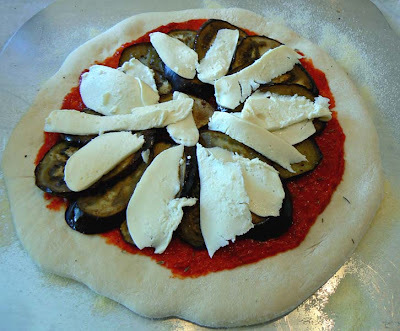 Some sauce, some herbs, the eggplant, and some mozzarella, and voilà, it's pizza time! These were very tasty and made a great lunch. A finished pizza on the peel. Yum! My standard practice is to make enough dough for two single-serving pizzas. We share the first one and then make a second one to share as well. This time I put thyme and oregano on the first, then some fresh basil on the second. 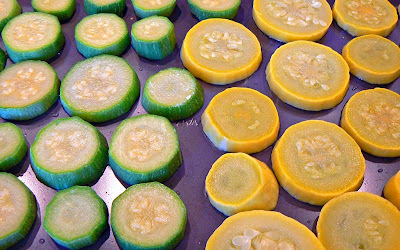 Since our summer squash has started producing, we've gone back to the recipe file to find interesting ways to eat it. I am preserving a lot of it by blanching and freezing the sliced squash in quart-size zip-top bags. Blanched summer squash disks before going into the freezer. 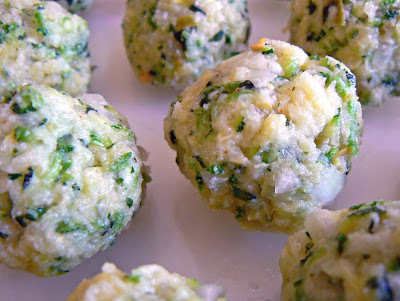 Otherwise, we've made zucchini fritters and little Indian-style zucchini meat(less) balls. Both were delicious, but I forgot to photograph the balls. 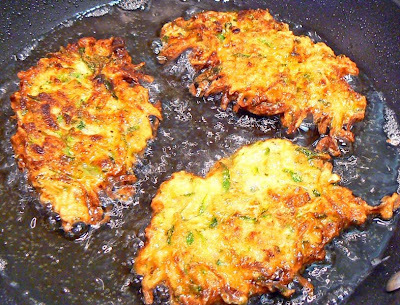 They were small and deep-fried in our friteuse and served with a spicy curry cream sauce. Today is a holiday in France so we don't get our normal bread delivery. 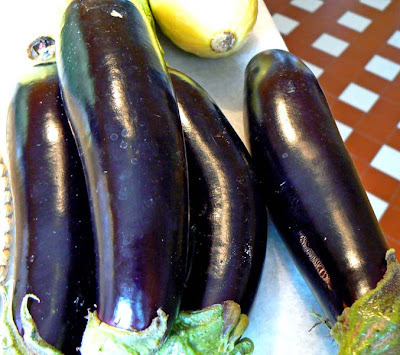 I'm going to make pizza crust and we'll have eggplant (from the garden) pizza for lunch. I wish I had thought of taking pictures when I planted the first row of beans, but I didn't. You may remember that I planted five rows of green beans successively over two months. I did it to ensure a continuous harvest. These images show the final row just after planting and its progress over the past few weeks. Well we've had two harvests so far. 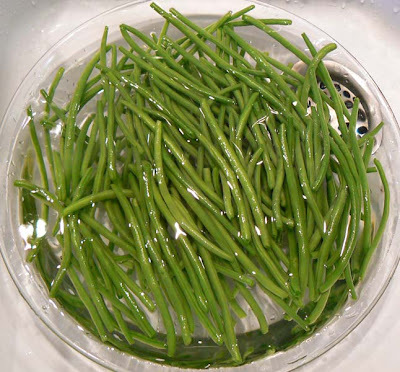 The first, a small one, was quickly made into an Italian green bean dish and eaten. 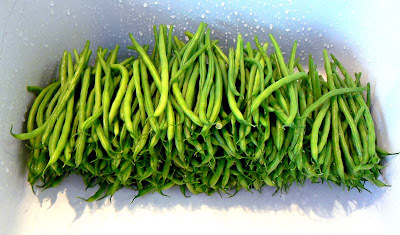 The second harvest was much more substantial and I blanched and froze two packages of beans. Each package weighs in at about 375 grams. And I'm still only working on the first two rows. There are many more beans out there getting bigger every day, and the third row is about to begin its production. There are still rows four and five to come, if we're lucky and the weather holds. And blanching and freezing the beans is turning out to be very easy, and much less trouble than canning. The other day, we had some neighbors over for drinks to talk with them about their upcoming trip to the western U.S. They'll be visiting L.A., San Francisco, Las Vegas, and the Grand Canyon, plus a few other places in between. Since they know we lived in San Francisco before moving here, they wanted to talk to us about it. Home-made California roll with toasted sesame seeds. So I made some California rolls to have with glasses of cold rosé! It was a relatively hot day and we sat in the shade of our deck to snack, sip, and chat. These little sushi-like rolls are ubiquitous in California. They're made without raw fish, so they're pretty easy to do out here in the country where sushi-quality fish is not easy to find. These are filled with cucumber, avocado, and a little smoked salmon. I made so much sushi rice that I was able to make eleven rolls. 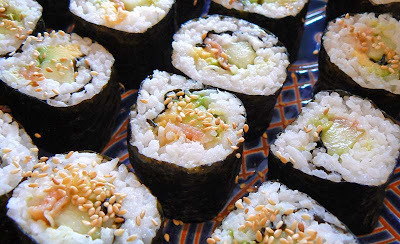 Each roll makes eight pieces, so that's eighty-eight pieces of California roll. We're still eating it. We got most of the ingredients (nori sheets, sushi rice, wasabi powder, sesame seeds) on one of our forays to Tang Frères in Paris a while back. The cukes, avocado, and salmon came from the local supermarket. We served the rolls with soy sauce and sliced pickled ginger, also from our Paris shopping trip. It turns out that our neighbors are on a guided tour, so they will end up seeing whatever the tour group goes to see. And they'll only be in San Francisco for two and a half days, so they'll get a pretty limited view of the place. Bidets (bee-day) are interesting and controversial fixtures. If you've traveled in France, you've no doubt encountered one. Or two. 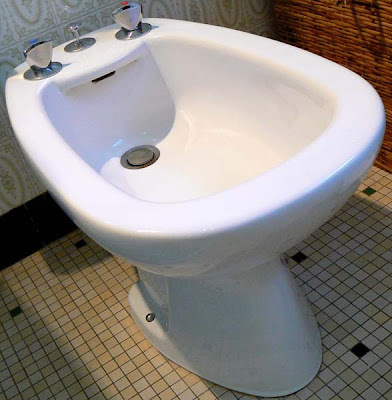 When I first came to France, back in 1981, I remember some of my fellow Americans remarking that bidets were disgusting, horrible things, and that they didn't want to so much as look upon one, let alone use one. And I wondered, use it for what? I had no experience with this thing. Over the years I've come to understand the bidet, and have used it both for its intended purpose and for other things. For example, it's a great place to wash out underwear and socks when traveling. A bidet also comes in handy for chilling a bottle of wine, if you have access to ice in your hotel, and you don't need to block up the bathroom sink. At home, it's a great place to pre-soak certain laundry items before they go into the machine. As it turns out, our house in France is equipped with a bidet. Ken and I have talked about it. He once suggested that we get rid of it and perhaps replace it with a toilet, so that we can have two in the house. I'd prefer to keep it. I like the fact that we have a bidet. It says "France" to me. I use it, not only for washing out things, but, from time to time, for its intended purpose. And I am not ashamed. 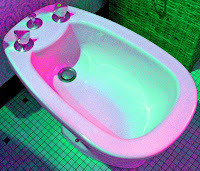 I am posting a poll today about bidets. You'll find it in the side bar on the right. Answer truthfully, if you dare. These are the first of this year's harvest. There should be many more in the coming weeks. It's chilly this morning. Just under fourteen degrees - that's mid-50s F. It's supposed to warm up as the day progresses. I've got to get outside and weed the vegetable garden and pick up apples and cut the grass. So that's my plan. 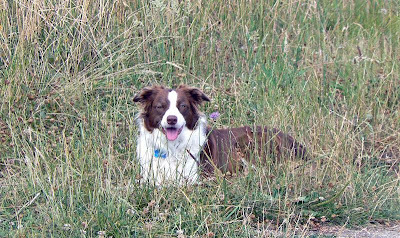 A dog in the grass. She looks happy, doesn't she? 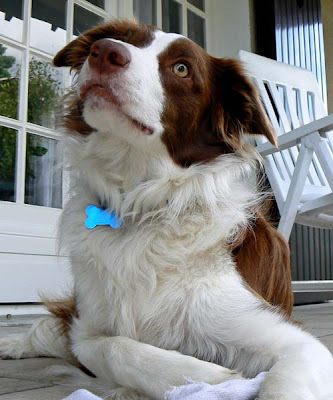 I'm posing, take the darned picture! Today we are going out to lunch at our local ferme auberge to meet someone that Ken knows through one of the France/travel forums he frequents on line. I went out to the garden right after my dog walk this morning to check things out, and I picked two zucchini and a good bunch of green beans. There are at least five more zucs out there and nearly a dozen yellow squash that will be ready over the weekend. Yikes! And now that the beans have started, there should be a steady stream of them for a while. 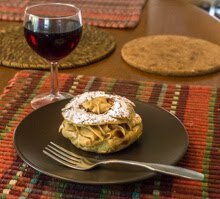 Last night's impromptu dinner chez les voisins was very nice. We started out with some apéros of which there was a choice of whiskey, bubbly rosé, and kir. I had the bubbly, which was served with three kinds of sliced saucisson (sausage). M had made broiled fish with a light cheese sauce that tasted much better than it sounds. Next up was a platter of buttered green beans and boiled potatoes sprinkled with parsley. Salad and cheese came next, of course, and dessert was a pear tart. 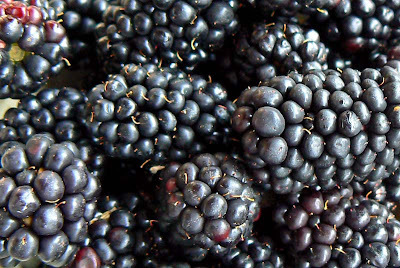 Big, juicy blackberries, grown right across town from us! We enjoyed all this out on the neighbors' patio. Another friend of ours from across town joined us for dinner. She brought us a bowl of mûres (blackberries) that she grew in her yard. They're incredible! When we mentioned that we didn't know that those grew around here, she looked at us like the foreigners we are and said, but of course they do! I'll bring you a cutting if you want. They don't have thorns and they're easy to grow. Well, bust my buttons! * The wild ones that grow at woods edge around here are some variety, while the good eatin' berries are another variety. Who knew? *Turn your sound on, but not too loud if you're at work! The mûres (blackberries) out in the vineyard are beginning to ripen, but they're not very big. I don't think our summers are hot enough long enough to produce big juicy blackberries. A blackberry stem arches away from the main bramble. But still, depending on the year, we can actually pick enough to make a pie. 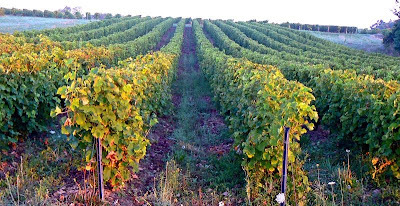 The closest patch to us was recently mowed down by the town, so we have to venture out around the edges of the vineyard to find some. There are some brambles in the woods next to our house, but getting in there to pick berries is a bit difficult. I remember a few summers, years ago in California, when we would drive up to the Sierra Foothills to our friend Sue's house for the weekend. Her long dirt driveway (it's since been paved) is lined with blackberry brambles, and so are some of the edges around her rather large property. She has to fight with them every year to keep them from taking over, and it's a chore. But in mid summer the berries ripen and Sue spends many hours out there picking. She freezes a lot of the berries and has them at hand all through winter. On the days that we were there to help, we wore long sleeves and jeans to protect our skin from the thorns while picking, and often the temperature flirted with 100ºF (nearly 40ºC). But the berries were worth every discomfort, in pies, in jam, or just by the handful. Another set of photos from out in the vineyard in recent days. Summer days, that is! 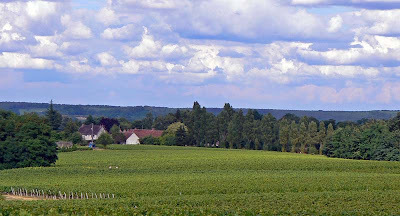 A view of our little hamlet from out among the vines, looking northeast. Walking in the vineyard is nearly always pleasant, no matter what season it is. Each season has its good points and a few bad points. For instance, in winter, the starkness of everything is strikingly beautiful seen in the glow of a low sun. But it can be cold and wet. 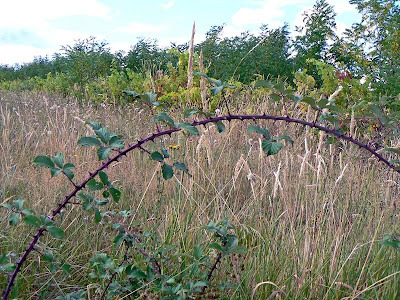 Transition between vines and grass. In summer, the woods and vines are lush with green and the wildflowers abound. But it can be hot and sticky, and there are gnats and midges orbiting your head. 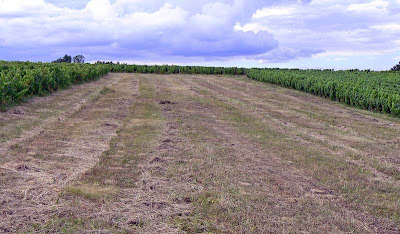 A freshly mowed patch between vineyards. Fall and spring are great, as well, watching the transitions, the pruning or the harvesting. 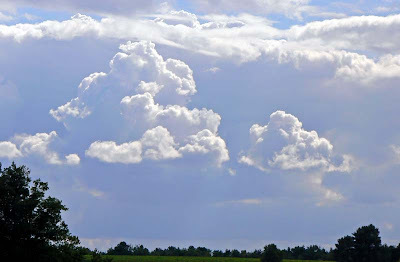 And the skies can be pretty dramatic, too. The best part is having the time to walk around and soak it all in. 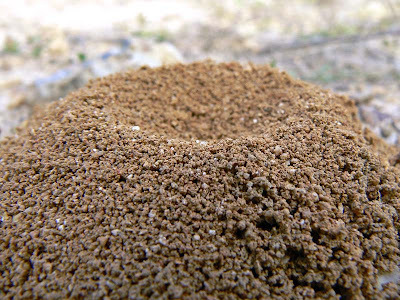 Okay, it's just a little ant hill. 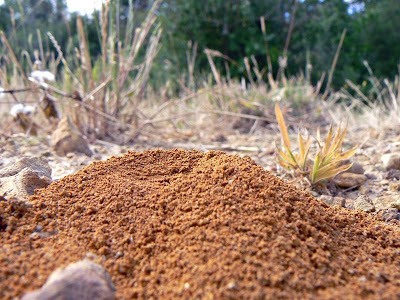 There's a certain place out in the vineyard where there are about fifteen or twenty of these little hills all together. They look like a miniature range of volcanoes.